AEM / CQ5 Archives | Boyle Software, Inc.
Dan McWeeney gives a good preview of some new social media / community features coming to AEM this Summer. The bundle is being called “FP4” and the target release date is June. Boyle Software is proud to continue a long tradition of work for New York University. We did our first work for NYU over ten years ago; and last year we expanded the relationship and started migrating various schools and departments to the University’s implementation of the Adobe Experience Manager (AEM) content management system. Last month we started designing and developing new, custom functionality for NYU, including coding new AEM components. In addition to CMS work, we continue to assist several NYU departments with UX design as well as a broad mix of front- and back-end coding. A school as large, global and diverse as NYU will always have new technology challenges; and we’re thrilled to play a part in crafting smart solutions for them. If you missed it, please check out this blog piece about Uwe Kristen’s discussion of responsive design, given a couple of months ago at NYU. 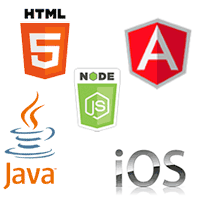 Boyle Software is proud to organize the New York City AEM/CQ5 Meetup. With a fast-growing membership – 257 and counting – the Meetup brings together technologists from all over the tri-state region with an interest in Adobe Experience Manager. As demand for this industry-leading content management system continues to boom, there’s little doubt that the Meetup will also continue to expand. 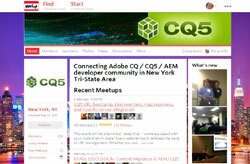 Are you in NYC and interested in Adobe CQ5? 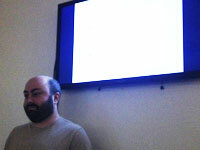 On Thursday, March 28th, Boyle Software’s TechTalk series continued with an excellent overview of Adobe Experience Manager – until recently known as CQ5. AEM is Adobe’s popular content management platform and the cornerstone technology of their Marketing Cloud. Boyle Software is kicking off 2013 with the launch of our Adobe CQ5 Solutions Group. With years of involvement implementing this popular content management system – from its start as a product of Day Software through its acquisition by Adobe in 2010 – Boyle Software is responding to growing demand by building up a team of talent dedicated to architecting, developing and supporting the award-winning CQ5 platform. Heading up the CQ5 Solutions Group is Matthew Davis, Boyle Software’s VP of Operations since 2011.